Is U.S. society “losing its collective mind” as the two parties’ “perfidious game” unravels? Uncle Sam’s “red-X day”… revisiting the food stamp rolls… reader asks The 5 what we’d do about ISIS, as if anyone would listen… and more! “Sometimes societies just go crazy,” writes the author James Howard Kunstler. Mr. Kunstler published these thoughts on Monday — 48 hours or so before the massacre in San Bernardino. Once you get past the initial shock of what happened, the striking thing is how nearly everyone is viewing the event through tribal blinders. Liberals are pushing the idea there’s been “more than one mass shooting on average every day this year” — never mind that the homicide-by-firearm rate has fallen in half over the last 20 years. Conservatives are pushing the idea gunman Syed Farook’s Muslim faith had been “radicalized” — never mind Southern California has been home to a large and well-assimilated Muslim population for generations. It’s not a new civil war… but is it too crazy to rule it out? “I doubt that I’m I alone in worrying that America today is losing its collective mind,” Mr. Kunstler goes on. Indeed, they are. “The perfidious game of the Democrats and the Republicans has backfired,” writes Chris Hedges. Mr. Hedges is a former war correspondent for The New York Times. His 2002 book War Is a Force That Gives Us Meaning comes with your editor’s highest recommendation. Although he’s a man of the left, he recognizes how both parties sold the country out. But now the game is up, he says: “Playing the Democrats’ mantra of cultural diversity against the Republicans’ mantra of cultural diversity weakening the fabric of American society no longer works as a mechanism of control. And then what? Back to Mr. Kunstler: “The phenomenon of demented lone gunmen killing strangers and innocents will morph into civil insurrection, especially as the major political parties break apart and the loosed factions set out to settle their old scores by whatever means they can. “History knows that violence is infectious and that social inhibitions melt away when the conditions are ripe. Groups give themselves permission to act outside the bounds of normal behavior, and all of a sudden atrocity is the order of the day. “Both Trump and Hillary have the mojo to destroy their respective parties and I think the probability is that they will. Unfortunately, we don’t live under a parliamentary system that recognizes smaller factions as legitimate parties, so we are sure to live through an era of political disorder. What emerges from that could be a very severe polity, since it will be based on the wish to restore order at all costs. 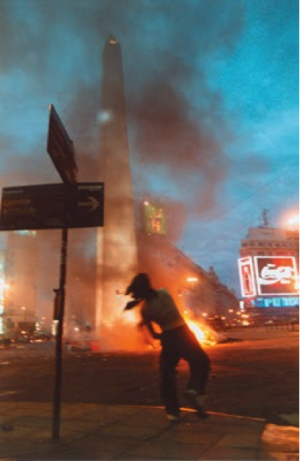 In other words, Argentina in December 2001. As we said on Tuesday, this week marks the 14th anniversary of the infamous corralito — in which bank accounts were frozen and the Argentine peso devalued 75%. You’ll also learn which traffic laws you obey at your own peril… the best kind of dog to own for protection (you can cross pit bulls off the list)… and the single biggest threat to your home during a collapse. We’re giving away 3,000 copies of this secret survival journal. And not a moment too soon, we think. Learn how to claim yours at this link. To the markets, where it’s all about central bankers — again. Yesterday, Fed chair Janet Yellen gave a speech signaling full-speed ahead on an increase in the fed funds rate at the next Fed meeting in two weeks. Then came the Fed’s “Beige Book,” which found “modest” growth in eight of the Fed’s 12 districts — also supporting the case for a rate increase. (No wonder our fearless leader Addison Wiggin took to calling it the “Lily White Book” some years back.) The Dow sank more than 150 points by day’s end. Barring a disastrous jobs report from the Labor Department tomorrow, an increase looks like a sure thing. Until it’s not, but we’re not there now — heh. As we write this morning, the big index has shed another 57 points, to 17,672. And today, the disappointment’s all about the European Central Bank. The ECB pushed its benchmark rate down from minus 0.2% to minus 0.3% — a smaller move than traders were hoping for. The ECB also extended its quantitative-easing program through March 2017. But it didn’t increase the size of its monthly bond purchases — which was also a surprise. With that, the euro has rallied from below $1.06 to above $1.09, sending the dollar index tumbling from above 100 to nearly 98. Gold dipped below $1,050 overnight but has recovered to $1,058. Crude sank below $40 yesterday but has recovered to $40.70. But those recoveries in gold and oil are weak and unconvincing, Greg Guenthner suggests in today’s Rude Awakening. 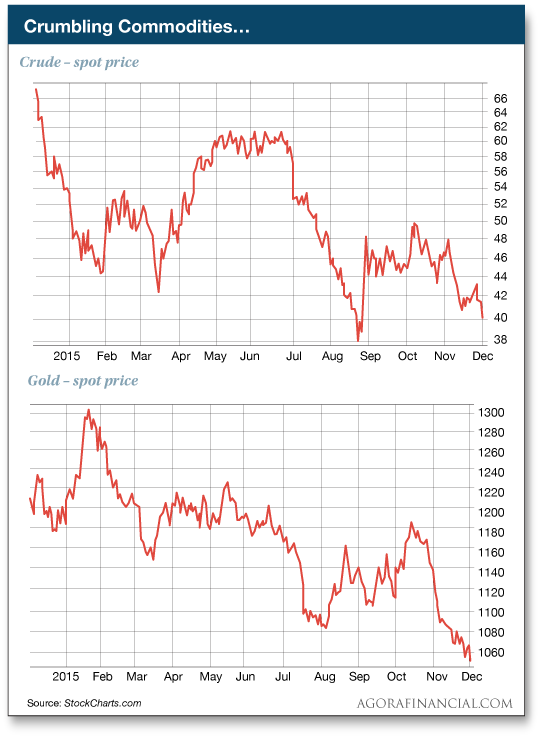 “Of course, oil and gold aren’t the only victims in the great commodity unwind,” Greg hastens to add. “Natural gas is teetering on another big breakdown. Copper is barely clinging to $2. And silver is sneaking below $14 this morning. 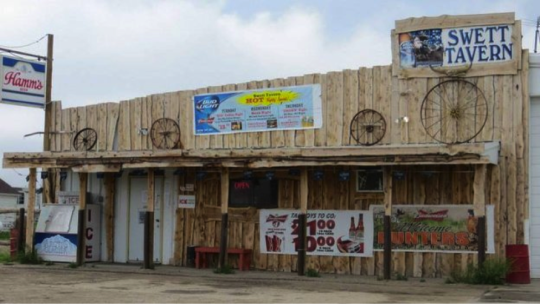 The town of Swett, South Dakota, is once again for sale. We told you about this opportunity in July of last year. The town’s population peaked at 40 after World War II. But now it’s just owner Lance Benson and his wife — overseeing a three-bedroom house, a tavern, a workshop and three trailers on 6.16 acres located two hours southeast of Rapid City. The Bensons were asking $399,000. And they got three written offers — all of which fell through “for a variety of reasons, including an inability to gain bank financing,” says the Rapid City Journal. So now it’s back on the block. Price reduced! $250,000. New improvements to the property include the removal of three decaying mobile homes and an old transport truck. “In the vein of ‘Black Friday,’ where does our federal equivalent ‘red-X day’ begin?” a reader inquires after we took note of the national debt crossing the $18.8 trillion mark. The 5: Hmmm… We’ll have to do some digging on that one. We can tell you this much: The year-over-year growth in the national debt as of Monday was $839 billion. Which casts juuuust a little bit of doubt on the Treasury’s claim that Uncle Sam ran up a deficit of “only” $439 billion during fiscal 2015. “I was just wondering if the number of Americans on EBT was really American families on EBT,” a reader muses. “In which case, that would be closer to 35-40% of the population covered by we the taxpayers. Stands to reason with numbers of under- and unemployed, not to mention those who have stopped looking for work altogether. The 5: The 46.7 million number is indeed individuals. For perspective, that’s 14.6% of the population — compared with 6.1% at the turn of the 21st century. “I find it puzzling,” a reader writes after yesterday’s episode, “that ISIS, a relatively small group (10,000? 50,000?) of armed extremists, continues to exist despite world outrage at their involvement in terrorism and the vast array of Western military might and opposition forces in the region. “I can only attribute this to paralysis caused by geopolitics. Turkey does not want the U.S. to give arms to the Kurds because if the Kurds become better armed and are emboldened by battlefield successes, they might press their demands for independence. The U.S. needs Turkey’s cooperation. On the other hand, the U.S. does not want help from Iran because Iran supports terrorism in other places and cooperation with Iran would alienate Saudi Arabia. Besides, Iran is already too involved in Iraq’s affairs to suit the U.S. The U.S. cannot cooperate with Russian forces because the two countries are at odds in the Ukraine and, in addition, Russia supports Assad in Syria and cooperates with Iran. The 5: As you might gather from most of today’s episode, fixing the world’s problems isn’t our bag. There’s no shortage of places you can go to see people spout off with “solutions.” We’re more comfortable in the niche of personal solutions — giving you the tools to tend your own garden in a world gone increasingly mad. But as long as you ask… we hinted yesterday at a first step toward a “solution.” And that’s to stop U.S. support for the regimes that are funding and otherwise fueling Middle East jihadis — especially Saudi Arabia. Fat chance of that, though. The Saudi princes’ hands reach deep into Washington, D.C., corrupting both parties. (See how today’s episode of The 5 is coming full circle?) One of Mitt Romney’s top campaign aides helps run a website called Arabia Now on behalf of the Saudi Arabian embassy. The embassy also retains the brother of Hillary Clinton’s campaign chairman. Is it any wonder the Obama administration has taken its cue from the Bush administration and continues to suppress the “28 pages,” as they’ve come to be known? We told you about them earlier this year. The pages are redacted from the Joint Congressional Inquiry into the Sept. 11 attacks. Those who’ve seen the unredacted document say it identifies Saudi Arabian citizens “complicit” in the attacks. P.S. Jim Rickards’ “Kissinger Cross” tool has just indicated it’s time to sell two positions… much to the benefit of Rickards’ Intelligence Triggers readers. One of the trades is good for an 80% gain in eight months… and the other’s good for a 117% gain after less than four months. Don’t feel bad if you missed out. The Kissinger Cross also indicates it’s time to enter three new trades. To learn how this unique indicator works and lay on these trades this week… look here.